Join us at the Designing Worlds Christmas Ball! The ballroom is decorated, Mr Merlin’s and Ktahdn Vesuvino’s dj rigs are in position, the Raglan Shire carollers are eyeing the mince pies, Oscar the Tookie is ready to greet you – all is prepared for the Designing Worlds’ Christmas Ball. All that is missing is YOU! Come and join us – 2pm – 5pm SLT, Sunday December 17th 2017. Garden of Dreams has a redesign, Designing Worlds has a new studio – and you are invited to come and celebrate! As many of you know, the Designing Worlds studio has been based on Kayle Matzerath’s Garden of Dreams for a number of years now, and we have been very happy there. Now Kayle has redesigned the whole region, and built us a whole new studio! It is – of course, because this is Kayle Matzerath – a wonderful new build. 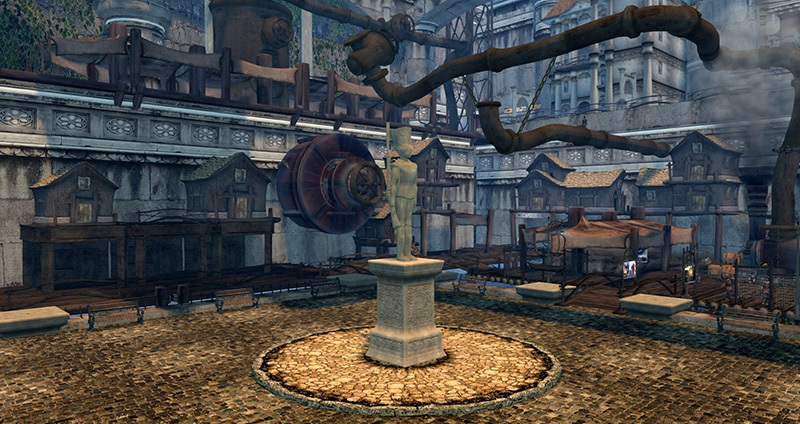 And not only that – Kilik Lekvoda has brought Titans, his lovely store of the cutest fantasy avatars, to a new home on Garden of Dreams. And you are invited to come and celebrate all this on Garden of Dreams, today, Thursday 15th June from 1 – 6pm. Lisa Brune will be singing live from 1 – 2pm, then Elrik Merlin and Zander Greene will dj for two hours each from 2 – 6pm. It’s going to be a great party – make sure you’re there! Join us here for a splendiforous party – and a chance to explore the studio, the stores and the beautiful region, filled with romantic little hideaways where you can dance, or cuddle, or simply hang out with friends. You are invited to Designing Worlds Christmas Ball! The ballroom is decorated, Mr Merlin’s steampunk dj rig is in position, Oscar the Tookie is ready to greet you – and all is prepared for the Designing Worlds Christmas Ball. Join us today for our Christmas Ball from 1pm – 4pm in our special ballroom, high above the Designing Worlds studio on Garden of Dreams! (Please note that you may need to use this teleport link twice – the first time will land you in the store on Garden of Dreams; from there you can teleport to the ballroom). There will be music – Elrik Merlin will be playing a very special Christmas set. There is also a Christmas tree with gifts set out under it for you to collect. If you would like to add a gift of your own to give to fellow Designing Worlds followers, talk to Saffia – she can help you place your gift. Oscar the Tookie is ready to welcome you, so put on your finest clothes and come and join us at the Designing Worlds’ Christmas Ball! Oscar the Tookie is ready to welcome you to Designing Worlds’ Christmas Ball! 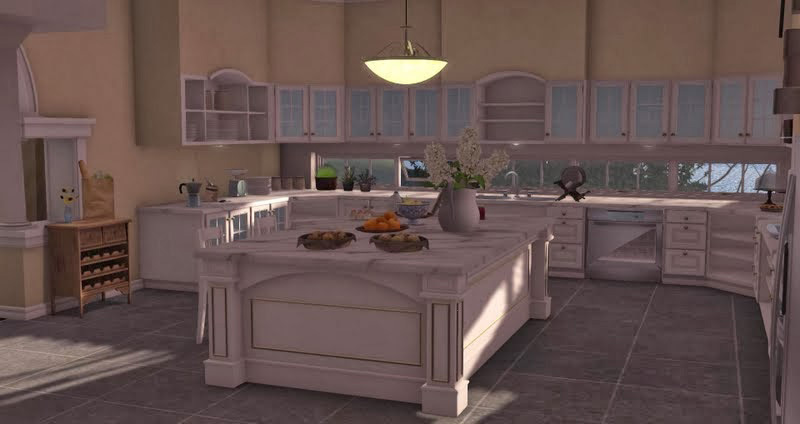 Episode 284 of Designing Worlds, the weekly show on design and designers in virtual worlds, was a retrospective where we revisited some of the most popular of our shows broadcast over the past year. We chose to present it from a Second Life landmark, the amazing and mysterious Forgotten City, by Mandy Marseille and Jenne Dibou. Only after we decided to do this did we learn that the Forgotten City was about to vanish forever from the Grid (although there will be a quarter-region memorial on the Mainland, “Ruins of the Forgotten City”). Just a day or two before it vanished forever, we took the opportunity to capture two elements on the Forgotten City – a video fly-through the main city and sequences of other notable areas of the region shot by Elrik Merlin; and a beautiful slideshow created by our show photographer Wildstar Beaumont. Our Forgotten City items were so well-received as part of Episode 284 that we’ve decided to release them as a mini-feature on their own. We do hope you enjoy these last looks at a wonderful place, and we wish Mandy Marseille and Jenne Dibou every success in their future projects. Thank you both for bringing a marvellous creation to the virtual world. 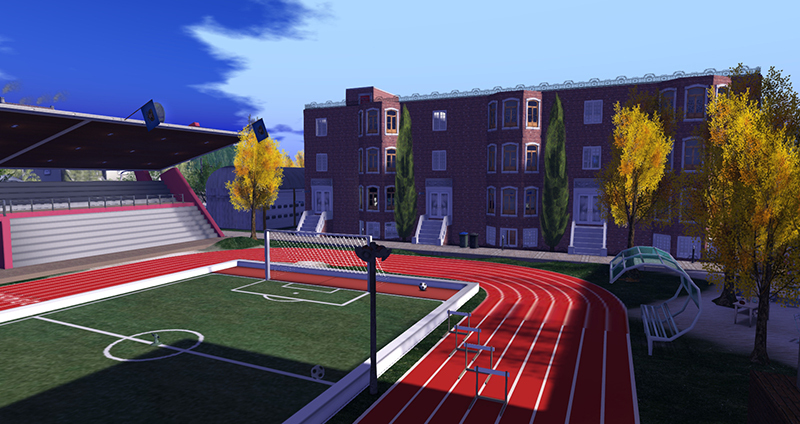 Designing Worlds explores the world of High School with Rocky Valley! 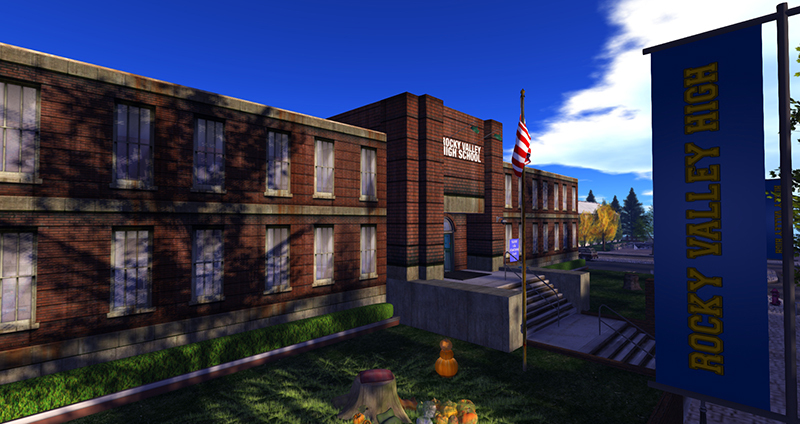 Join us today, Monday 3rd November at 2pm SLT Designing Worlds studio in Garden of Dreams for what might be nostalgic for some, and an American icon for others – the world of High School – as we pay a visit to Rocky Valley High School! In the past we’ve visited family communities and camps, even a school for younger children. This week we step into the world of jocks and cheerleaders, nerds and plastics, as we visit an American High School. We see the classes, the social activities and the sports, and we learn some of the reasons why people enjoy re-living their teen years, hang-ups, hang-outs, heartaches and all! There are other roles you can play in the community, and we learn something about that too from our two hosts – Kate Watson, Admissions Administrator and Michele Sabetha, Captain of the Cheer Squad. And the community itself has a wider role to play. We first met the cheerleaders of Rocky Valley High School at Relay for Life when they had a campsite opposite the telethon studio and were doing enthusiastic cheers all weekend! Join us for tonight’s show – and our audience members will receive special gifts too … the sports team are called the bears, and there will be special football and cheerleading bears for our audience to collect. So don’t miss it! 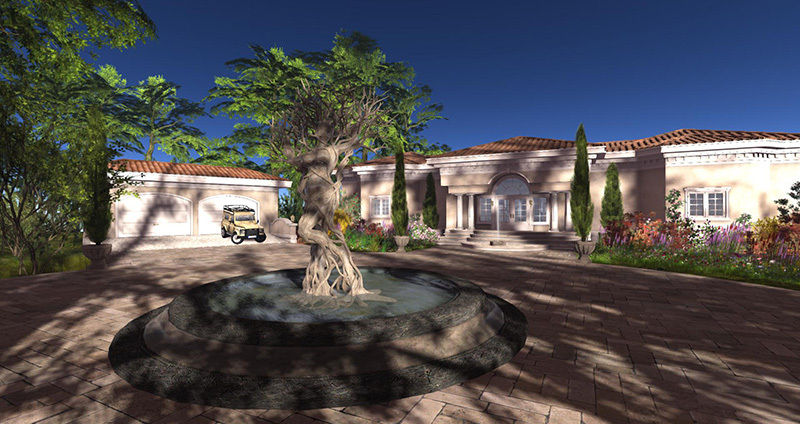 Or – if you can’t attend in person – tune in to the web at 2pm SLT on Monday for a showing on SLartist or on Treet – or catch it later in the week on our shows page on the Treet.tv web site at http://treet.tv/shows/designingworlds, on the SLArtist.com channel, the Aview TV Designing Worlds channel – or on the Designing Worlds blog. 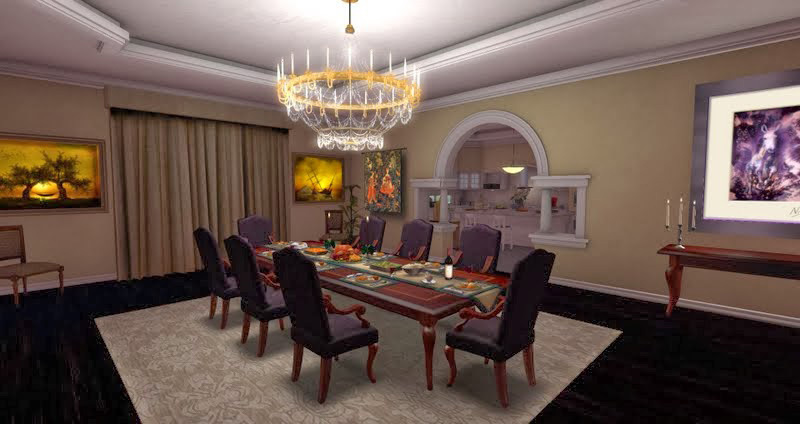 Celebrate Thanksgiving in Style with Designing Worlds! Our special edition of Designing Worlds for Thanksgiving is now available on the web! Thanksgiving (and the US Thanksgiving happens this Thursday) is a time for giving thanks – and so this year for our annual Thanksgiving show, we decided to give thanks for the amazing design work that is being carried out in mesh. To do this, we asked the team behind the group Mesh Creative to host our Thanksgiving Dinner, in a house specially created, landscaped and furnished for this very special occasion! We were joined by Loz Hyde of Meshworx, Cain Maven of Maven Homes and Quantum Luxury Designs, Maxwell Graf of Rustica, Lilith Heart of Heart Botanicals and Pamela Galli of La Galleria, while Samantha Ohrberg acted as cat herder! Other designers whose work appears on the show include Froukje Hoorenbeeke of Dutchie, Colleen Desmoulins of The Loft, Domineax Prospero of The Domineaux Effect and Isla Gealach of Cheeky Pea, among others. 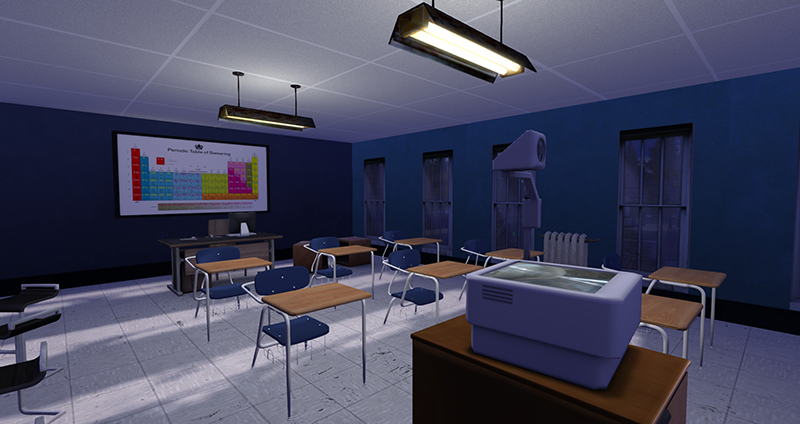 And the walls are decorated with some beautiful Second Life Art. 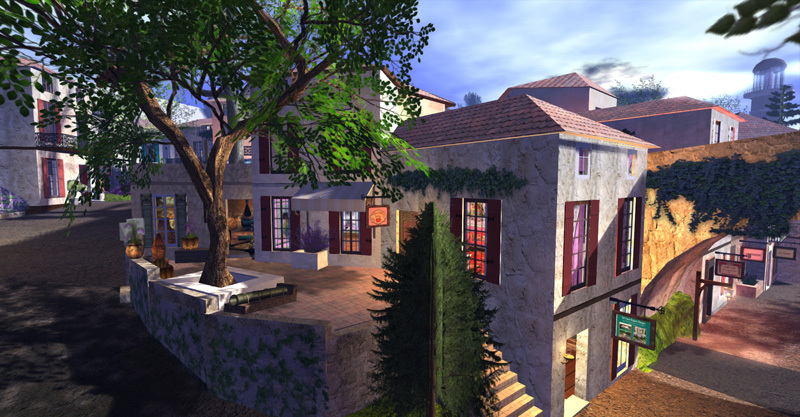 Join us at 2pm SLT today, Monday25th February, for our new episode of Designing Worlds at our studio in Garden of Dreams as we visit the beautiful estate of the Coeurs, sometimes called the Duchy, a series of fourteen French baroque regions, each named after a specific region in France. This is, however, not the highly formalised world of the Court, nor the seething poverty that led to the French Revolution, but a gentle and gracious style of rural living, with the bourgeoisie and the haut bourgeoisie living in beautiful surroundings with beautiful small towns and elegant homes, graced by the occasional chateau. We are joined on the show by two of the owners of the estate, His Grace the Duke and one of the two Duchesses of the Coeurs – but we have permission to introduce them by their less formal names, as Bedrich Panacek and SkyeRyder Varriale! 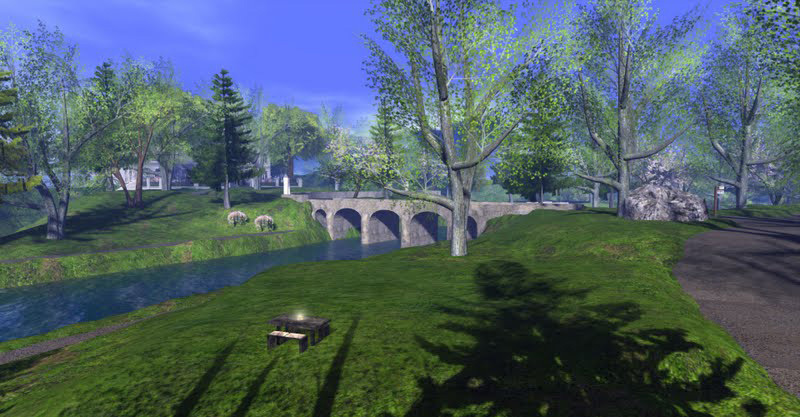 In their company, we explore museums, canals, courtyards and carriage rides – because the Duchy has one of the most elegant systems of transportation anywhere in Second Life, as residents can order carriages to come to their door and take them anywhere in the estate. Or – like Elrik – some might prefer to travel by boat and see the amazing locks, based of locks designed by Leonardo da Vinci. It makes for a fun and fascinating show – so do come and join us at 2pm.